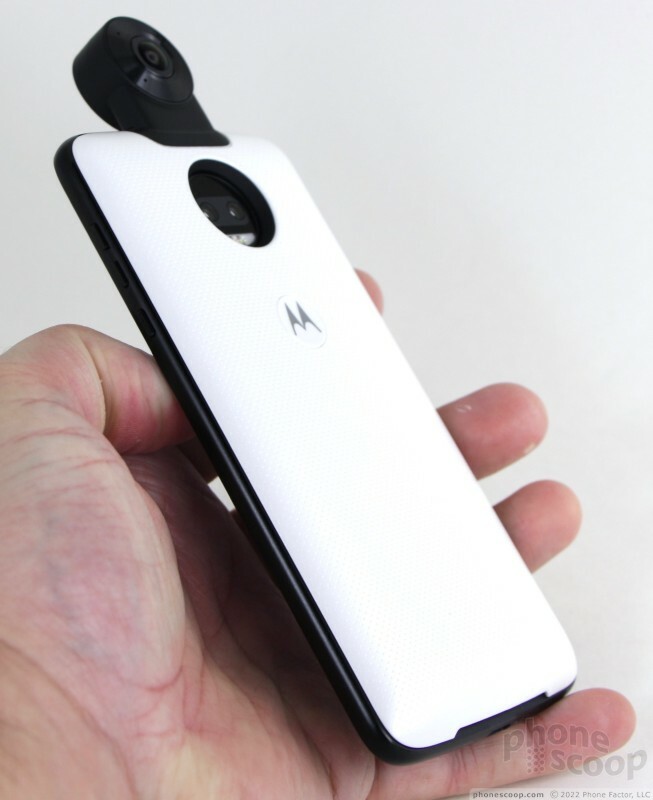 Motorola expanded its ecosystem of Moto Mods this year and none is quite as enticing as the 360 Cam. This snap-on modular accessory adds a 360-degree camera to your Motorola smartphone for capturing immersive pictures and video. Here is our assessment of this 360-degree shooter. 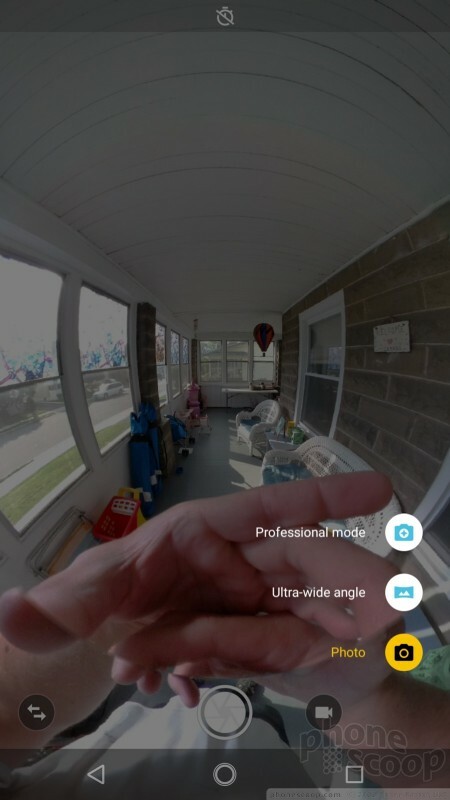 Google began toying with 360-degree photography through its PhotoSphere tool within the Google camera app, and later via the Google Cardboard Camera app and Cardboard viewer. 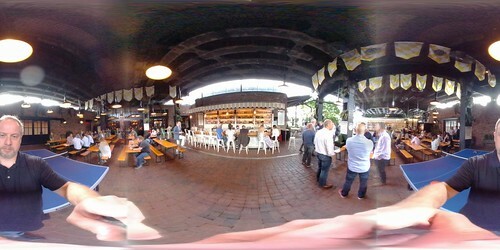 PhotoSphere required a lot of work, as you had to pan the phone around in every direction. The Cardboard Camera only had you pan around in a circle. Awkward either way. These were a nice entry point, a place to see the basic potential, but not fully matured offerings. 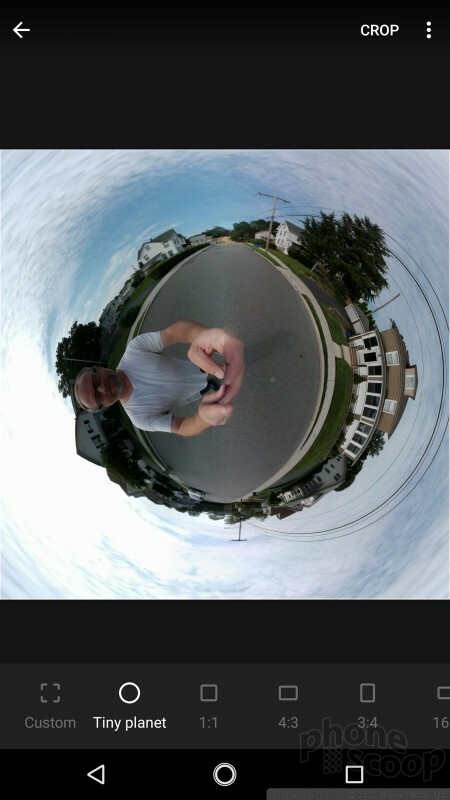 The primary problem is the way PhotoSphere and Cardboard captured 360-degree shots, leaving out huge portions of the sky above and ground below the shooter. The resulting images were simply not the whole picture. 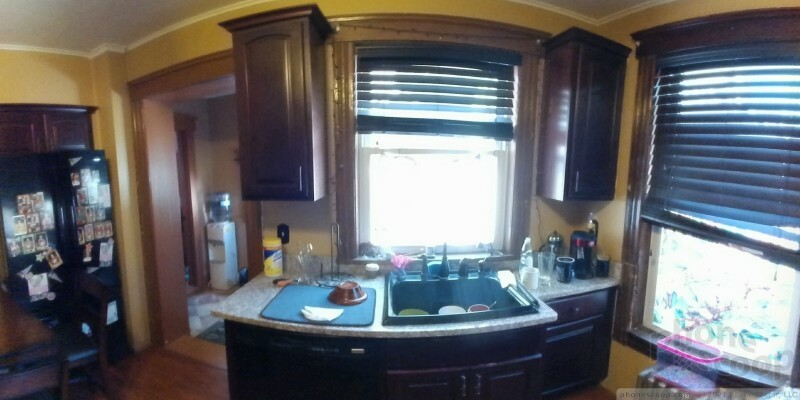 Dedicated 360-degree cameras fix this issue by using two opposing lenses that each capture 180-degree images. 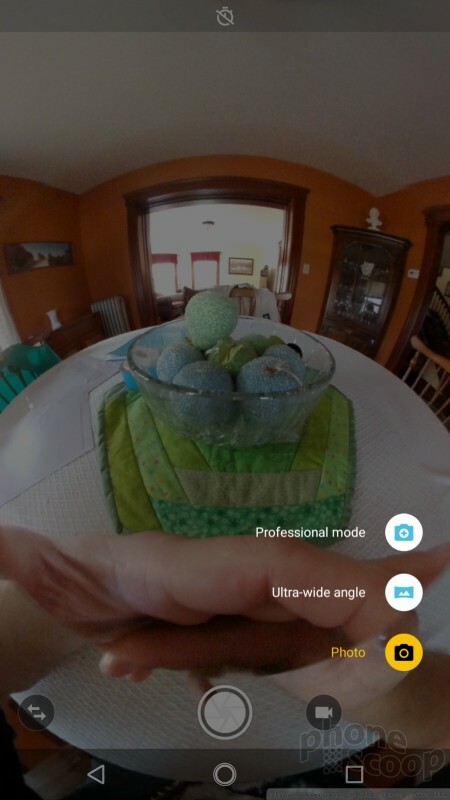 (Some high-end 360 cameras use more lenses.) The software then stitches the two shots together to create one seamless (or so we hope) 360-degree shot. The idea is to generate a photographic bubble wherein the shooter is standing in the middle. Using your phone or PC — or, better yet, a VR headset — you can then pan around and see what the experience was like when actually standing there. 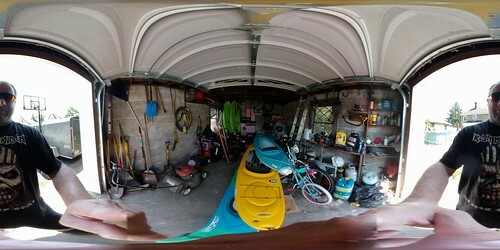 I've really come to love this type of photography and enjoy taking 360-shots, particularly when I travel. It's a great way to share the experience with my kids when I get home. 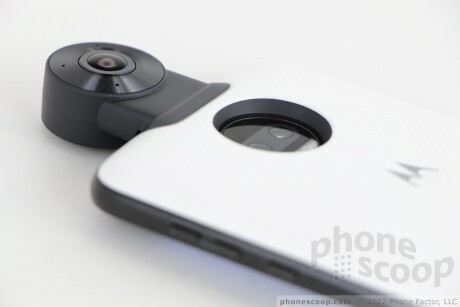 The Motorola 360 Cam is a 360-degree camera brought to life as a phone accessory. 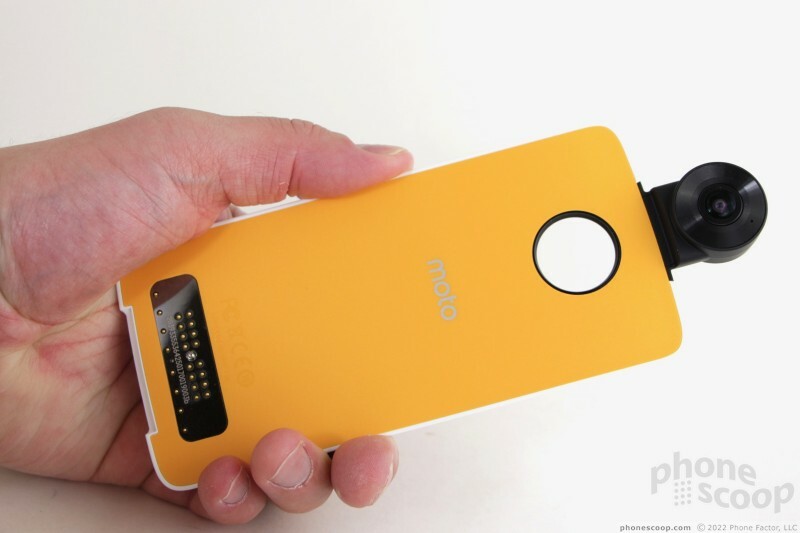 It attaches to the back of any Moto Mod-compatible handset and takes two opposing 180-degree images that are then stitched together on the phone where they can be edited and shared. It is worth the (lofty) price of admission? 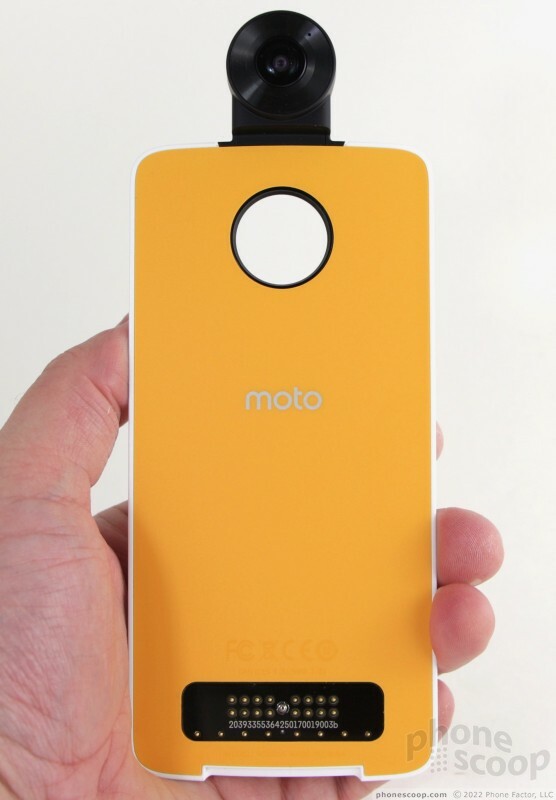 The Moto 360 Camera resembles most Moto Mods. 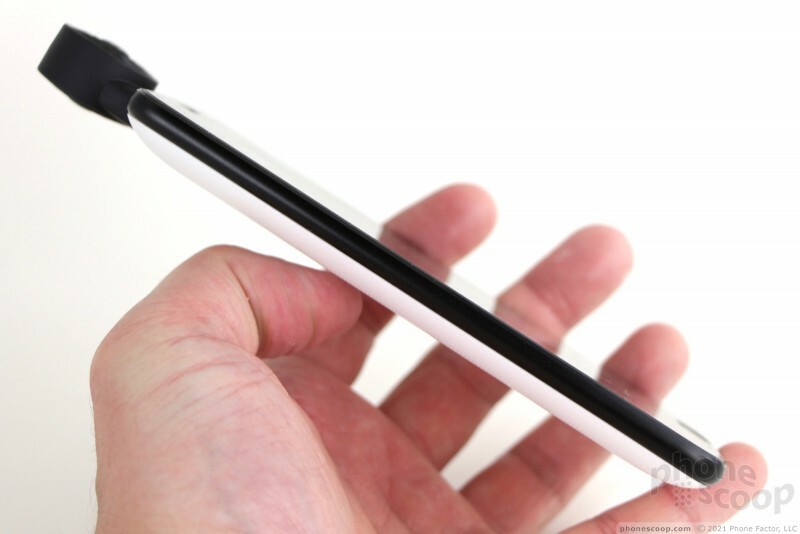 It has the same basic footprint, with a large hole near the top to accommodate the phone's camera module and the magnetic connector near the bottom to affix the Mod to the handset. 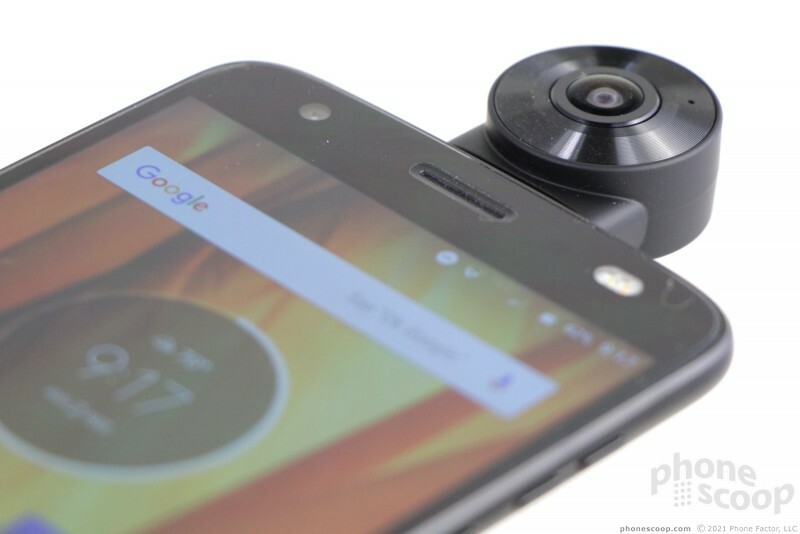 Like all Mods, the 360 Cam attaches to any Moto Z-series smartphone firmly and securely. A small notch along the bottom of the Mod makes it easy to pry off. The interior surface of the Mod shell is colored orange for some reason, while the exterior is white. 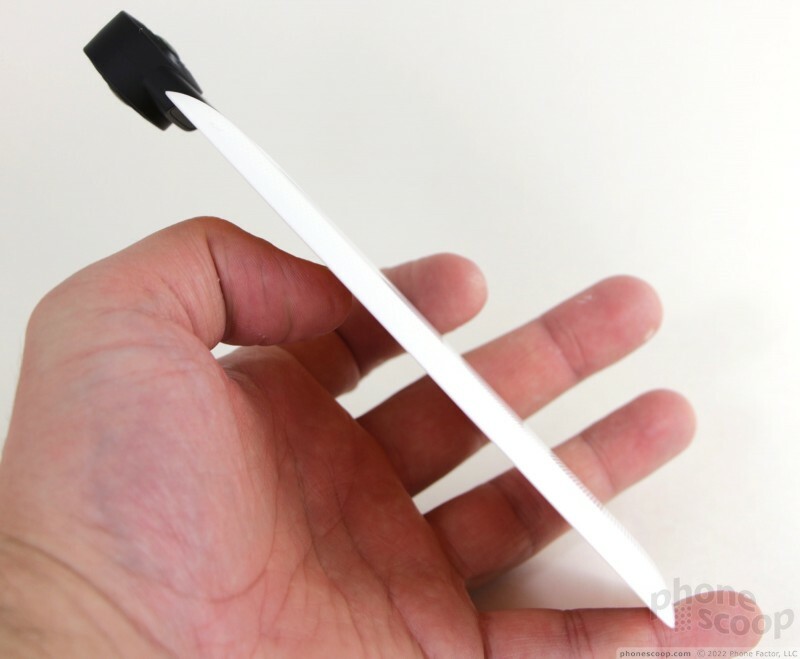 It's made from plastic and has a dimpled pattern to give it some grip. 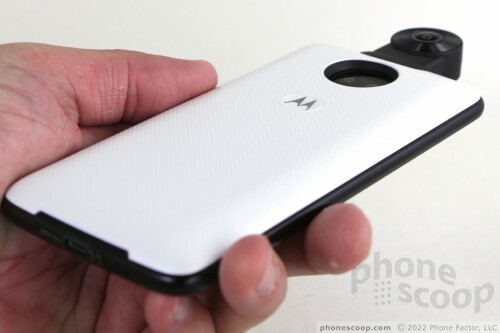 The Motorola logo on the rear of the Mod doubles as a shutter button. Neat. I found the button easy to find and use by feel. 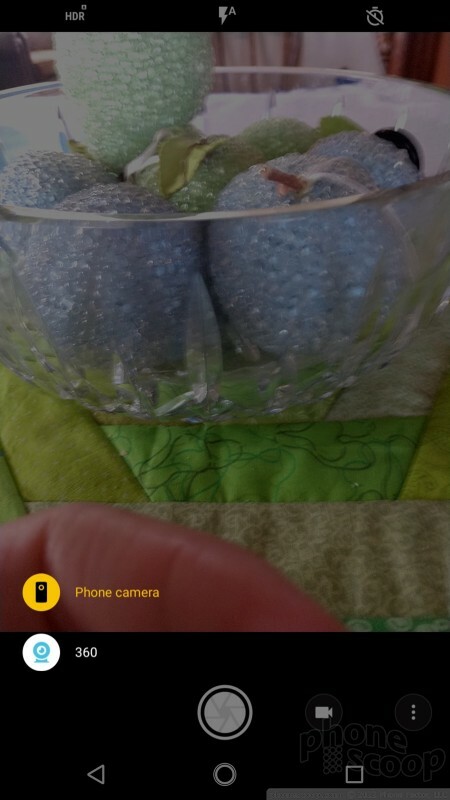 The button has great travel and feedback, but you can use on-screen controls to shoot pictures if you wish. The camera array itself juts out from the top of the Mod, forming a stalk of sorts that's a bit more than an inch tall. The two glass lenses are pea-sized bulbs. They collect fingerprint grime and smudges easily. 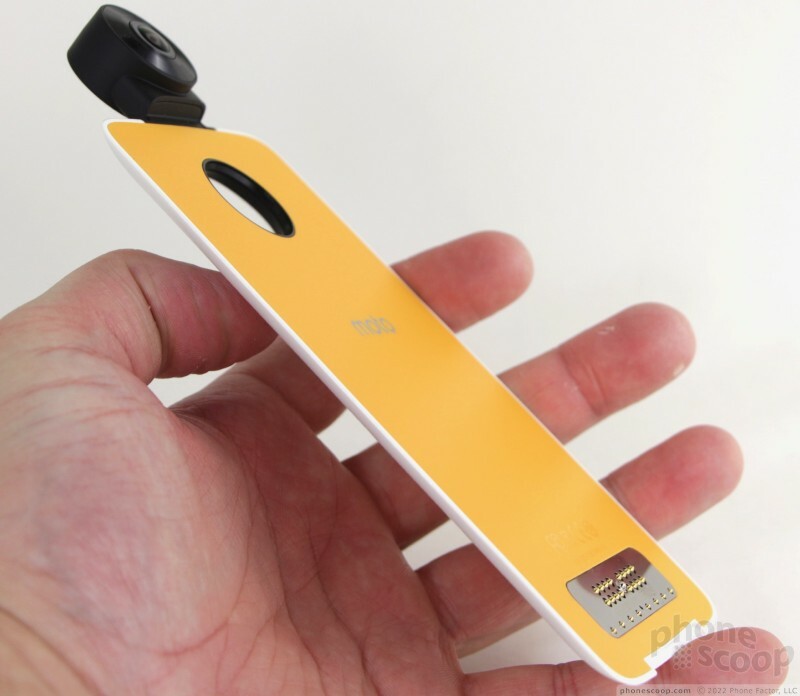 Motorola thoughtfully included a rubber hood for the camera to protect it from damage. The hood is thick and provides a nice buffer between the hardware and anything that might damage it. Unfortunately, the hood is rather small and easy to lose. I wish it had a tether of some sort. I have no real complaints about the hardware at all, though Rich would like me to point out that the Mod is much larger than many standalone 360 cams. It's not meant to be attached to the phone all day long. 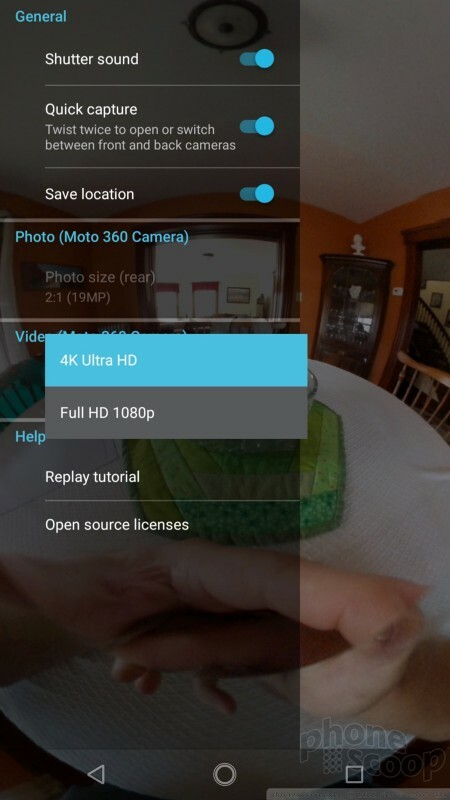 When you first attach the 360 Cam to your Moto Z, the Mod Manager app will walk you through the basics. Mine required a quick software update and includes its own camera application. 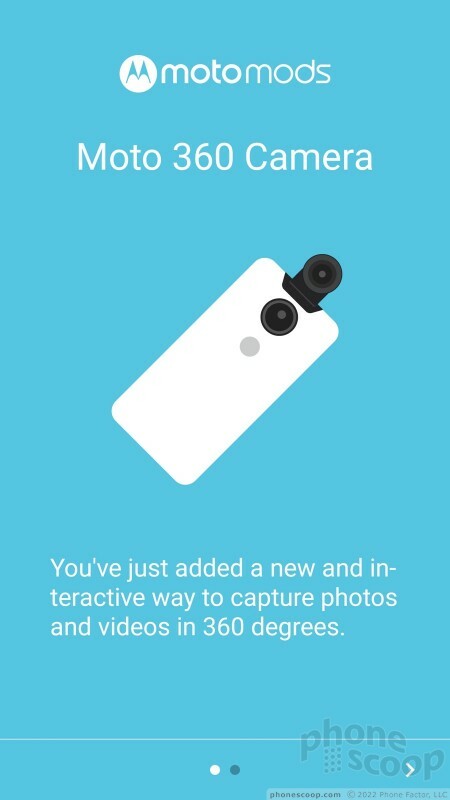 The camera app lets you easily take control over the 360 Cam and its various modes and functions. 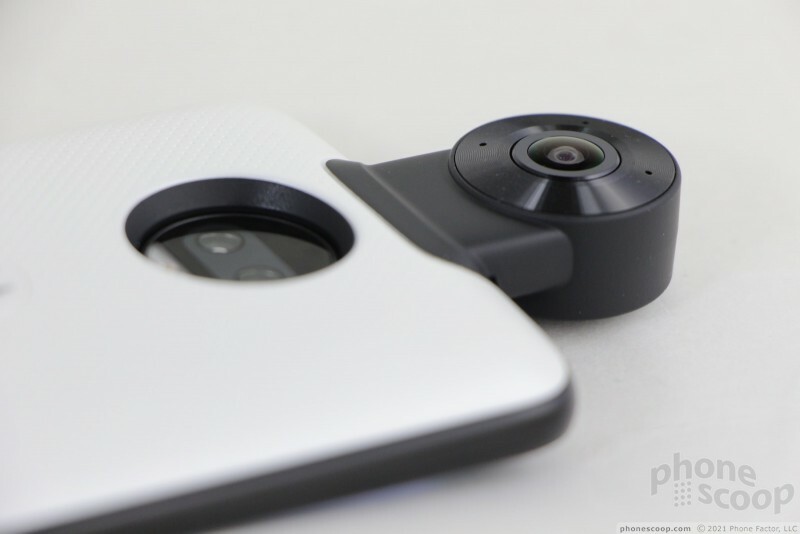 Most of the time, the Moto Z will automatically launch the 360 Cam when you slap the Mod onto the back of the phone. Sometimes it doesn't. 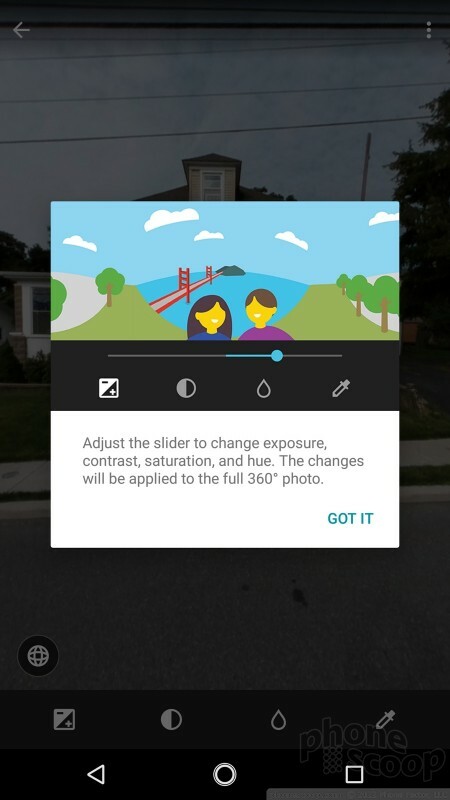 If you already have the regular camera application open, it will crash. 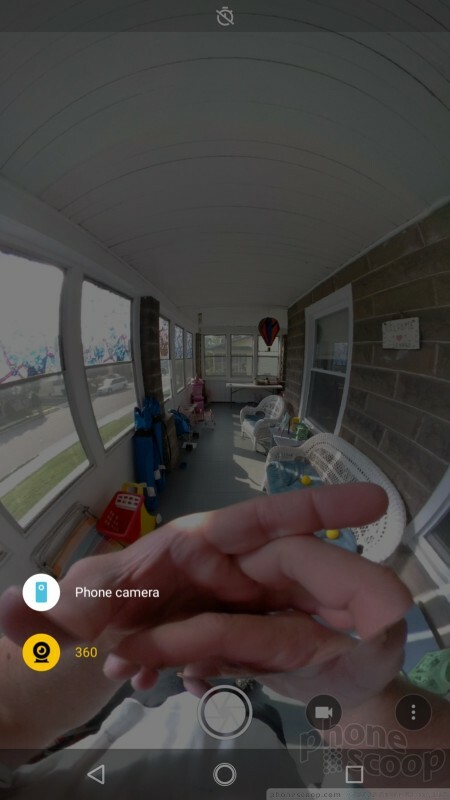 The 360 Cam app is consistently slow to open, which I found frustrating. Launching the app could be a smoother process. 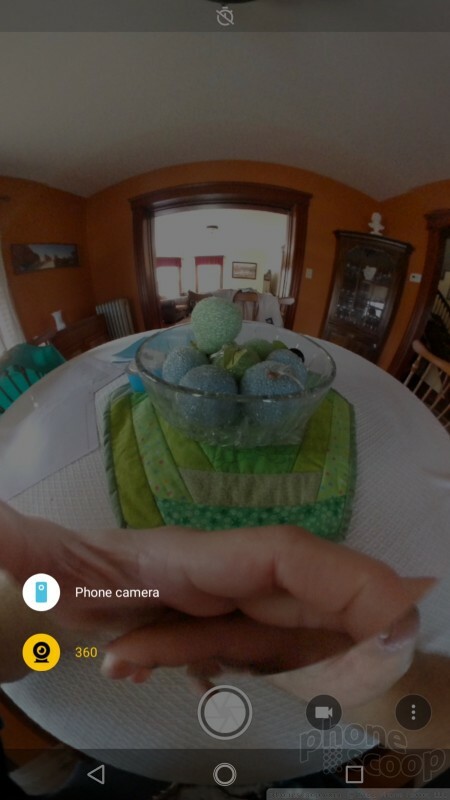 For the most part, the 360 Cam app behaves just like Motorola's standard camera app. 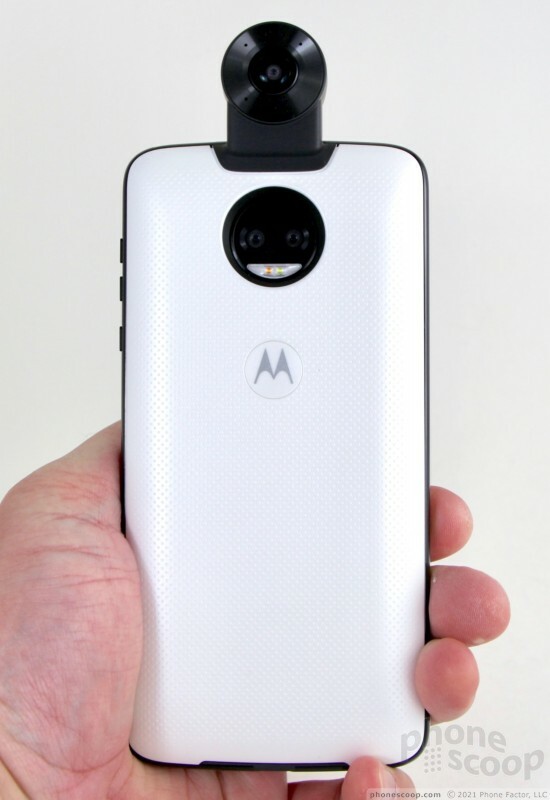 You need to hold the phone vertically (portrait) for the "best experience" according to Motorola. The shutter button appears at the bottom of the screen along with some additional controls. 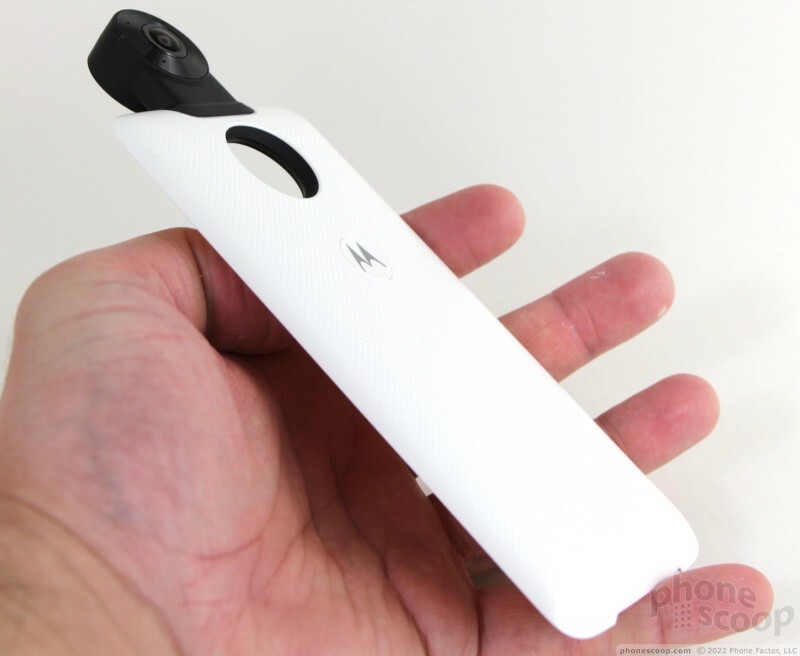 There are several shooting modes: 360 photo, wide-angle photo, 360 video, and professional mode. These are all rather self explanatory. The 360 photo mode is the default. 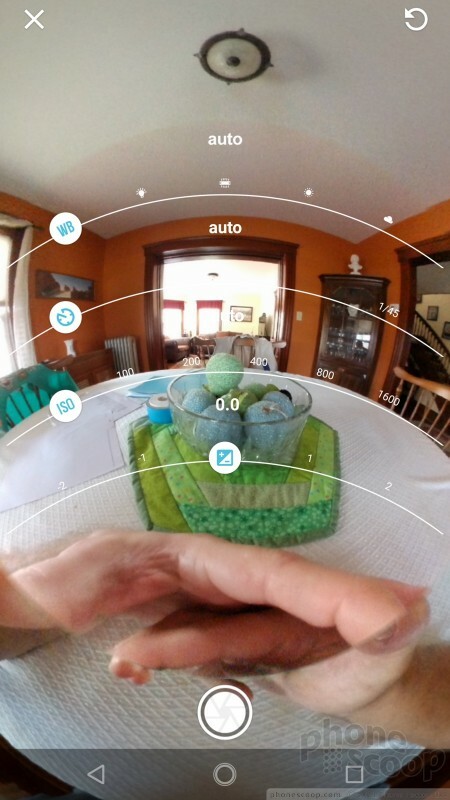 Simply press the shutter button to take a 360-degree shot of everything. The wide-angle photo mode lets you take 150-degree shots facing one direction with either the front or rear cameras of the Mod. 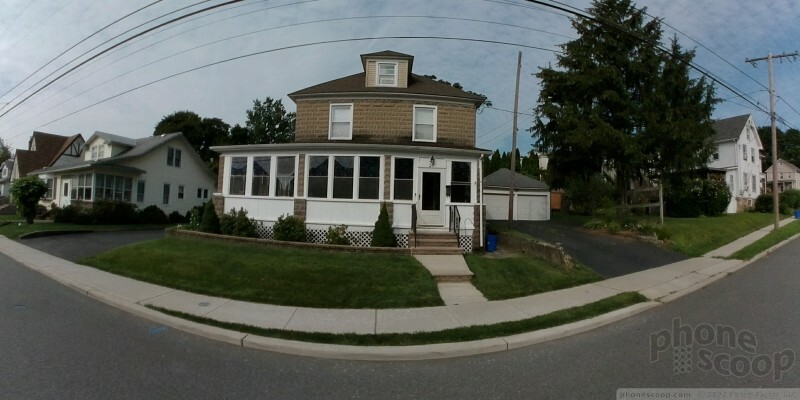 The results from wide-angle shots have obvious optical distortion (fisheye effect), but it isn't too bad. The professional mode allows you to take control over things such as exposure, white balance, and so on when shooting 360-degree photos. 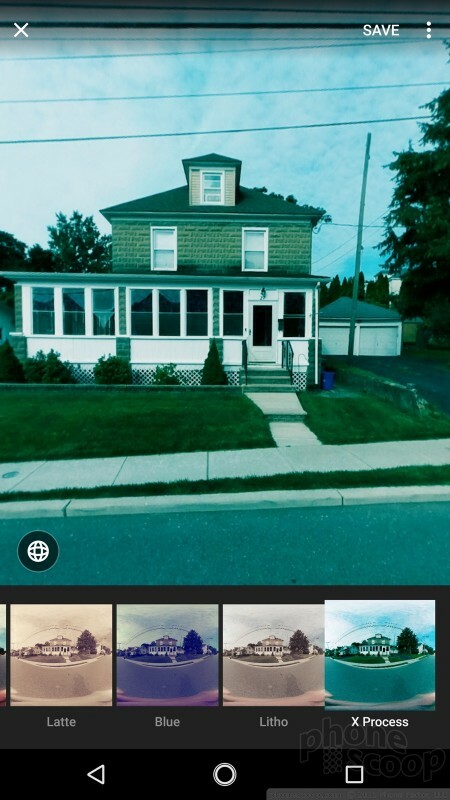 These take some practice to master, but the app does provide a visible preview as you adjust the various settings. 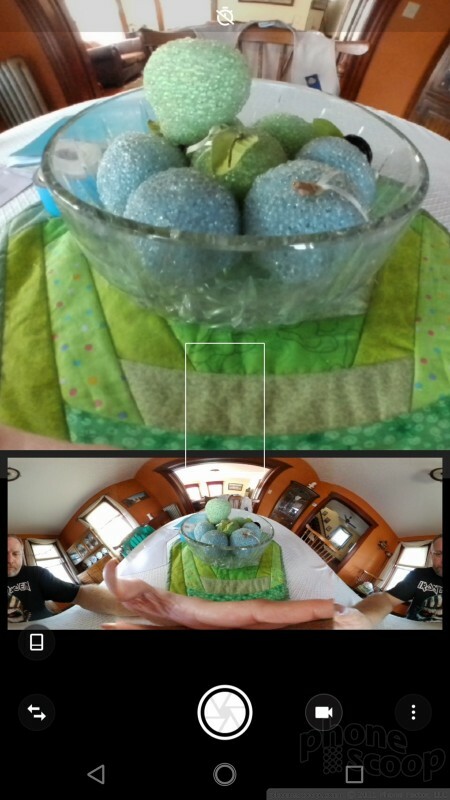 I like that the app presents you with three different ways to see what the 360 Cam sees. 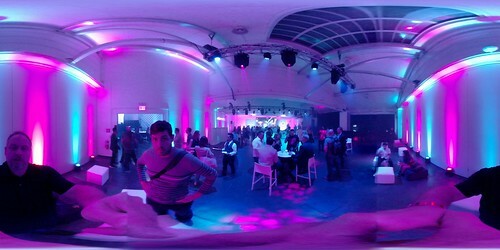 The first is the standard 360-degree globe shot with you in the middle. 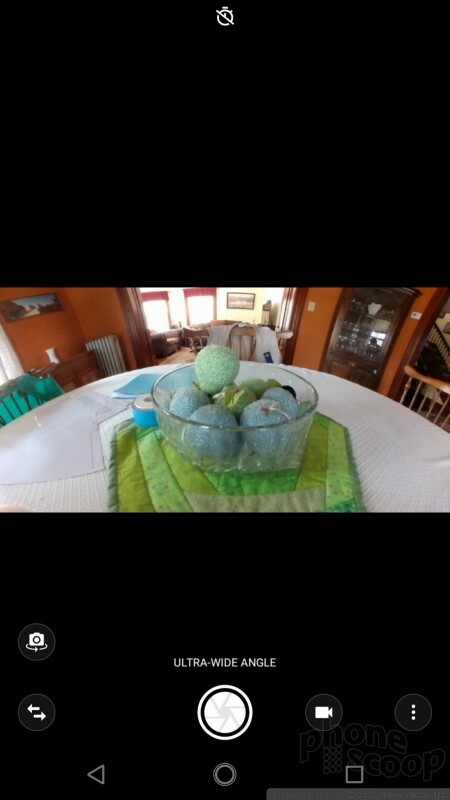 You can use your finger to drag the image to pan all around. The second shows you two, equal flat images from the separate cameras. 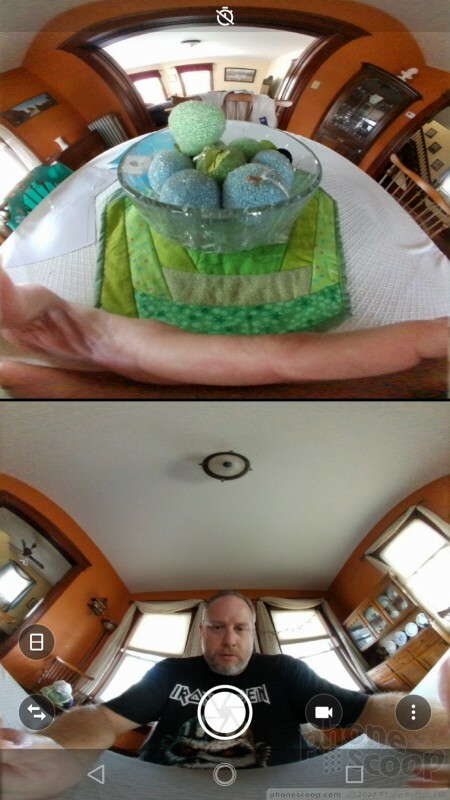 These two images appear on top of one another in the viewfinder with the forward-facing camera view above the rear-facing camera view. The last view is more complicated. 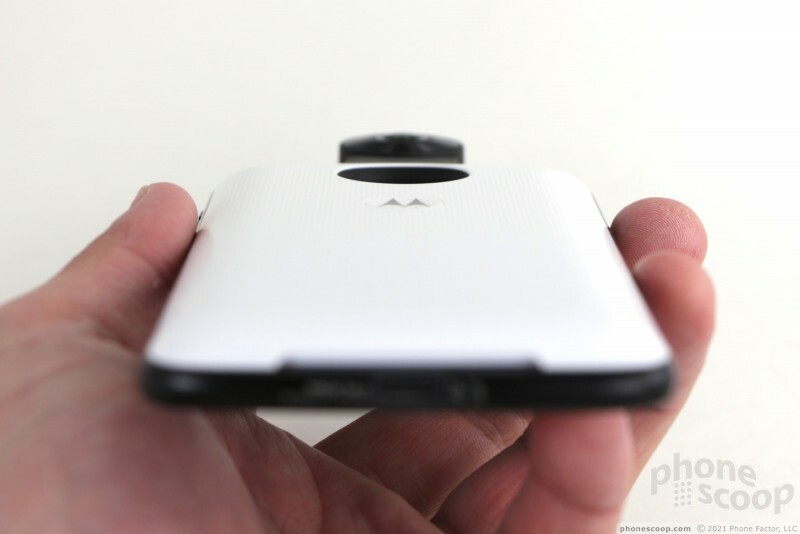 The top two-thirds of the viewfinder shows you a small preview window of the 360-degree image. A wide-angle strip fills the bottom one-third of the viewfinder. You can drag this strip back and forth to move the zoomed-in view around. It's rather awkward. I think the first two viewing modes make the most sense. 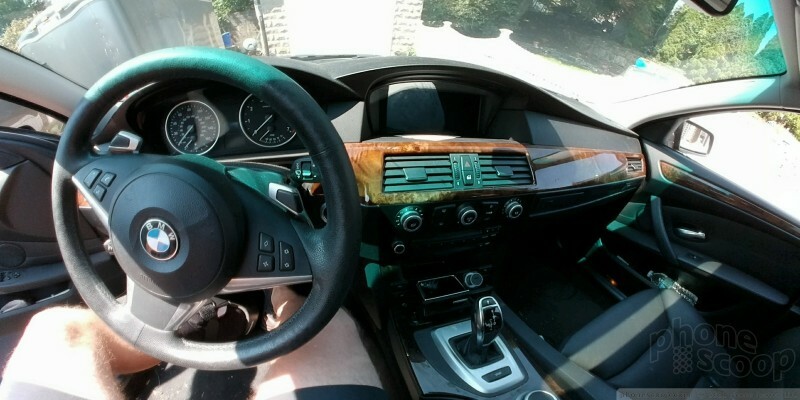 The 360 Mod is slow to capture images. 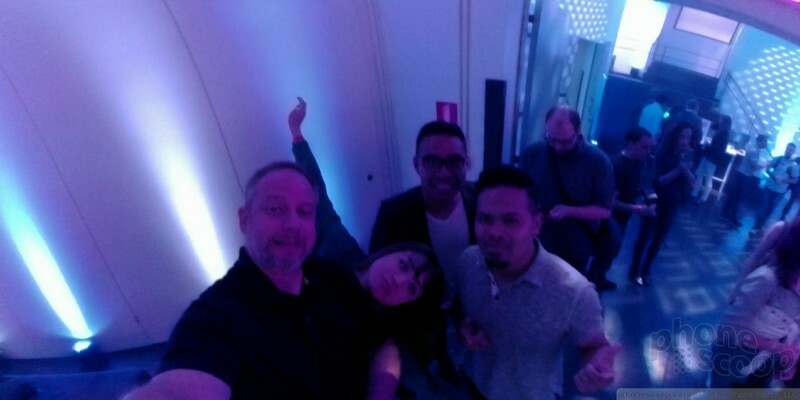 First, there is a short delay between when you press the shutter button and when 360 Cam shoots the picture. You may accidentally move the camera during this brief instant, creating blur in the final image. It then requires another second or so to process and store the resulting pictures. 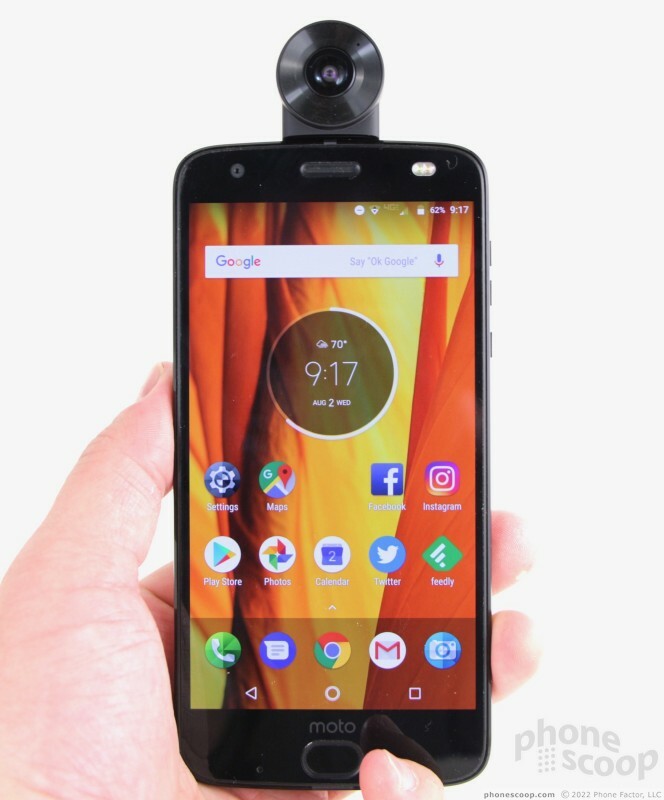 I expected a bit more from a phone powered by a Qualcomm Snapdragon 835 processor, (we tested using the Moto Z2 Force,) but the Mod may have its own circuitry performing some of the image signal processing. Speed isn't the biggest issue when capturing 360-degree shots, but it's still worth noting. 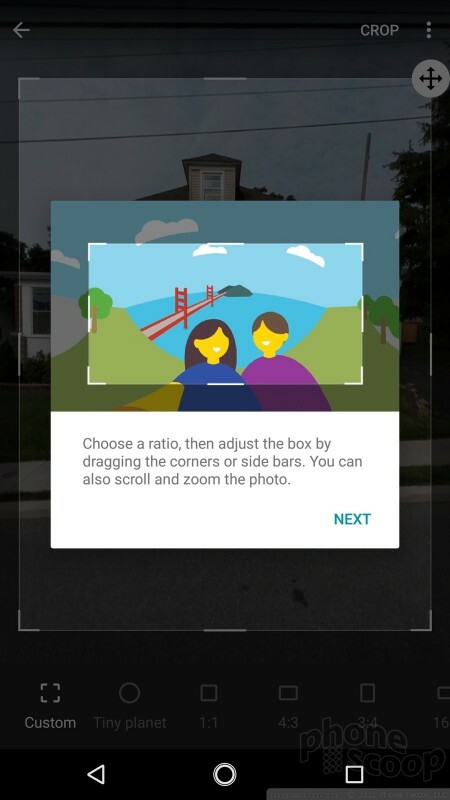 After you've taken photos or video, the application allows you to perform some basic edits. 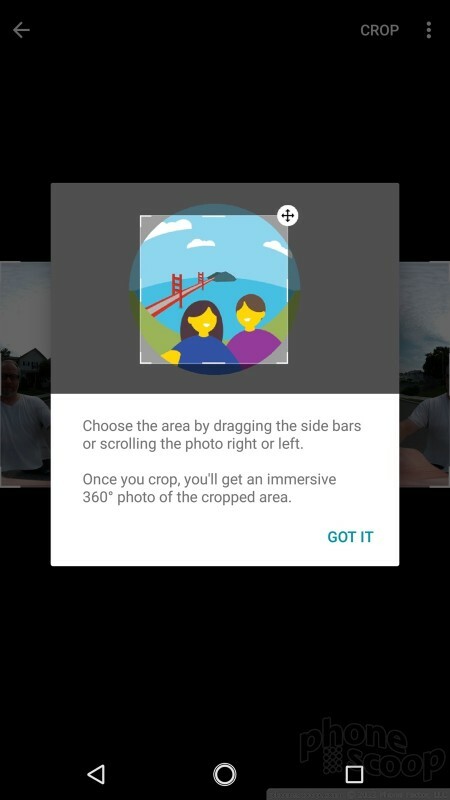 For example, you can select smaller regions of the 360-degree shot for cropping and sharing, you can apply various filters, and you can trim video clips. 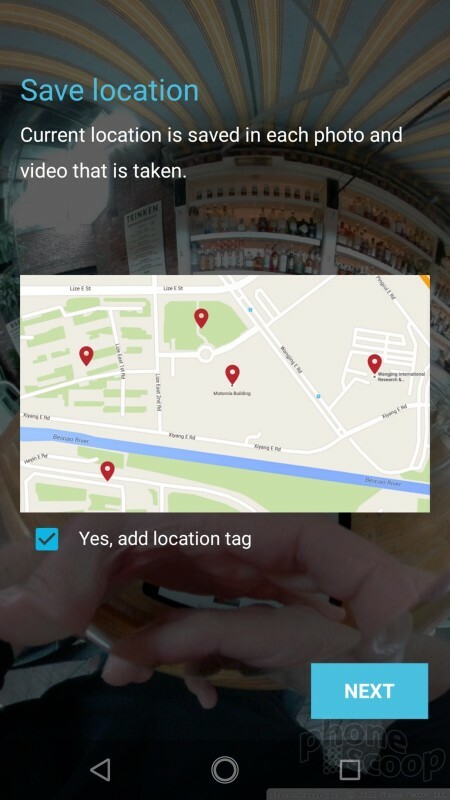 On-board tools make it easy to share to platforms that support 360-degree imagery, such as Facebook and YouTube. 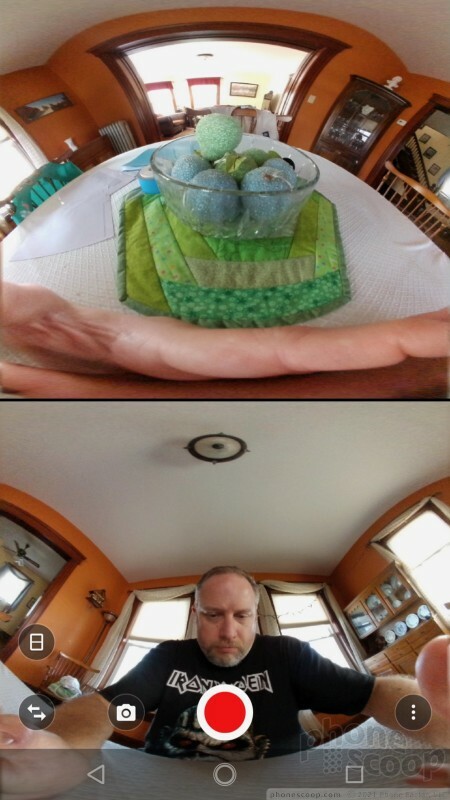 The 360 Cam app is somewhat slow and janky across the board. I wish it didn't freeze or crash so often. 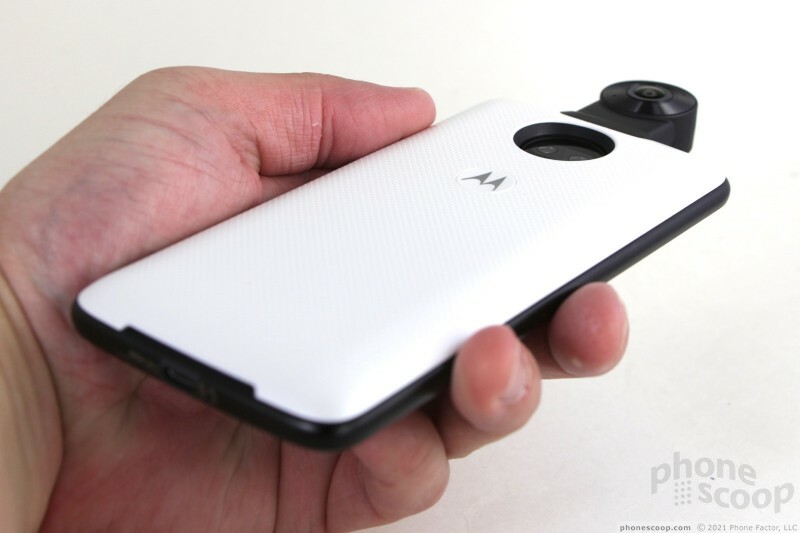 Hopefully Motorola has some stability updates in the works to smooth out the kinks. There are limits to what 360-degree cameras can do, and the 360 Cam Mod is hindered by all of them. First, clarity. The 360 Cam is squeezing a huge amount of subject material through a pair of tiny lenses onto a pair of tiny sensors. Together, the two sensors capture 19.5-megapixel images at f/2.0. The resulting images are soft and grainy. 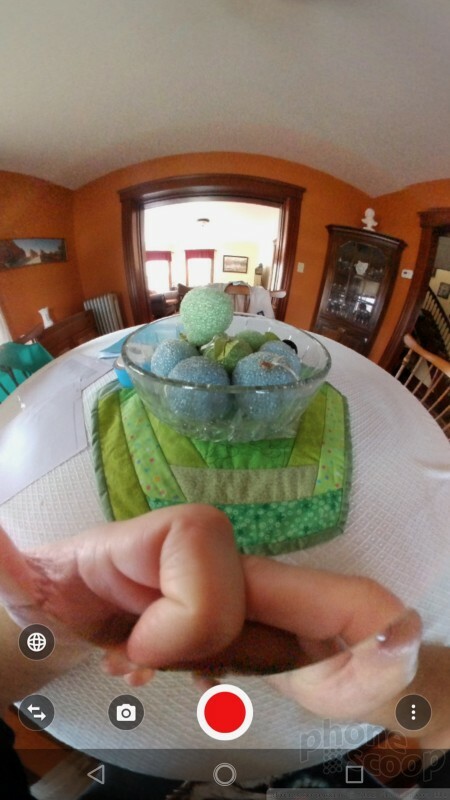 The 360 shots look okay on your phone, but if you blow them up on a PC screen or view them in a VR headset you'll see messy noise and lack of sharp focus all over the place. 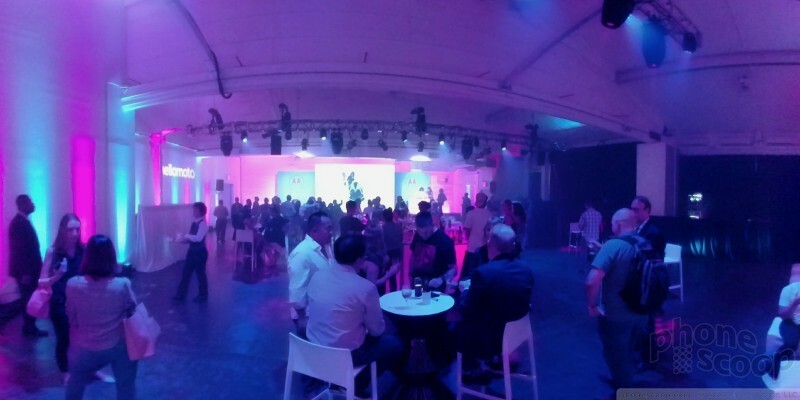 These problems are obvious in the shots I took at Motorola's launch party, where the grain is insane. 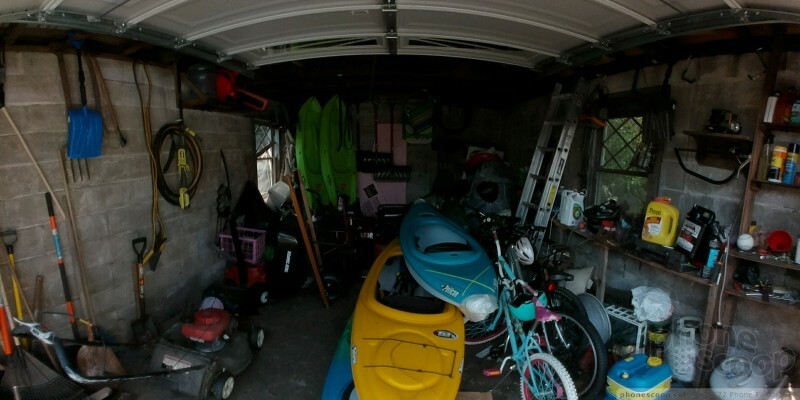 You can view more 360-degree photos here. The bigger problem, however, is exposure. The 360 Cam has almost no ability to balance contrast-y scenes. That means you get totally blown out bright spots and detail-lacking dark spots. 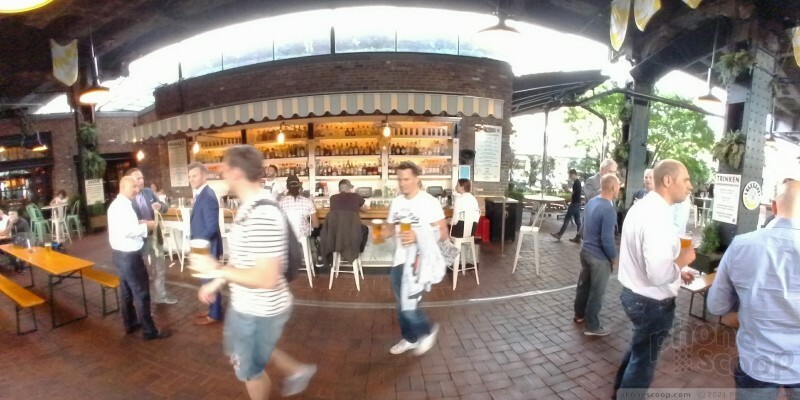 You can see the issue laid bare in some photos I took at The Standard Biergarten. The windows above the dining area are completely overexposed, while the tables are very dark. 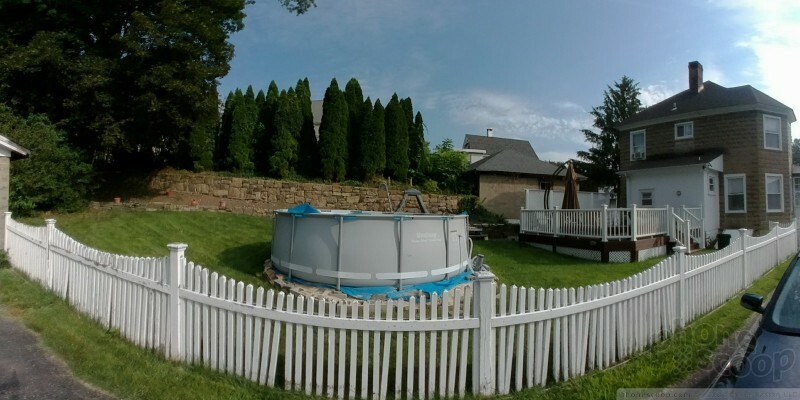 As always, you'll get the best results by taking the 360 Cam outdoors on a sunny day. Lots of even lighting helps improve clarity and exposure dramatically. 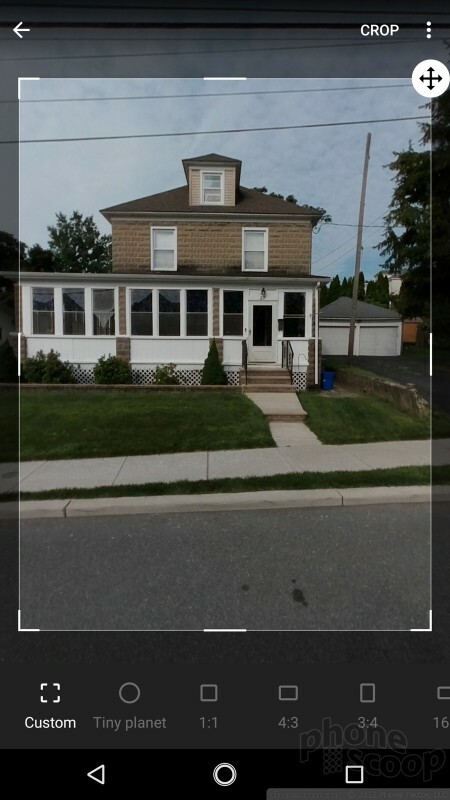 You can see how much better the images look in my driveway and the street in front of my house. No matter where you shoot images, the stitching is fairly obvious. Worse, the two cameras produced slightly different white balance results for me, which means half the image is a hair more yellow than the other. This is maddening. Video results are only slightly better thanks to the way the camcorder constantly analyzes exposure, and so on. 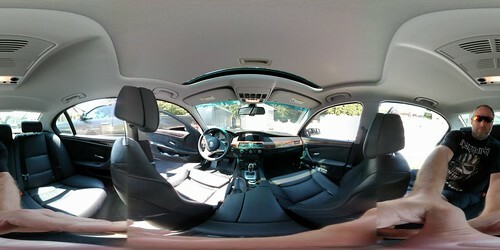 I do like the way the 360 Cam captures 3D sound. It's best listened to through a good pair of headphones where you can really hear the sound stage move around depending on what you're recording. 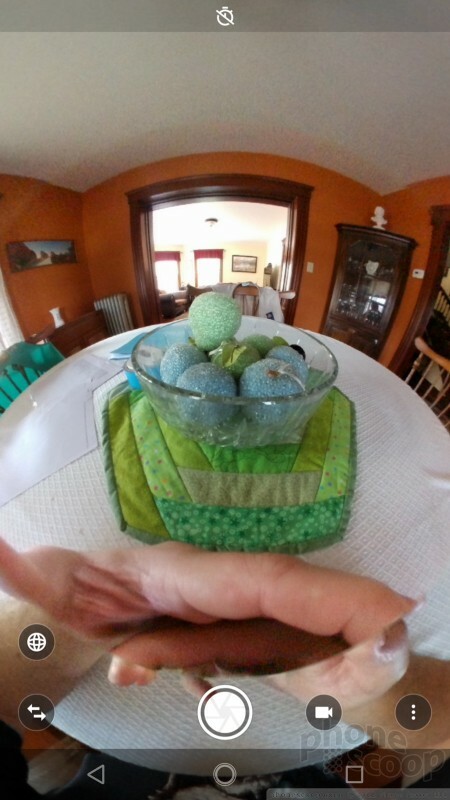 The Moto 360 Cam produces mediocre 360-degree images and does so at a high cost. I do appreciate the ease-of-use and flexibility offered by the Moto Mod nature of the camera, which can be slapped onto your phone and used at a whim, but problems abound. The Mod itself is a slim addition to your Moto Z handset. Attached to the phone, it travels well in a bag, though perhaps not in your pocket. The software that controls the camera is well-designed and yet its instability and sluggish performance get in the way. The images are okay, and definitely fun to look at, but the poor clarity and uneven exposure ensure I won't be sharing them any time soon. 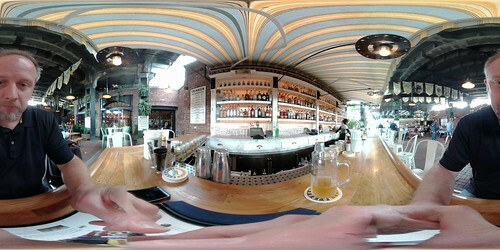 For people who've not experienced 360-degree photography before, perhaps the results will delight. 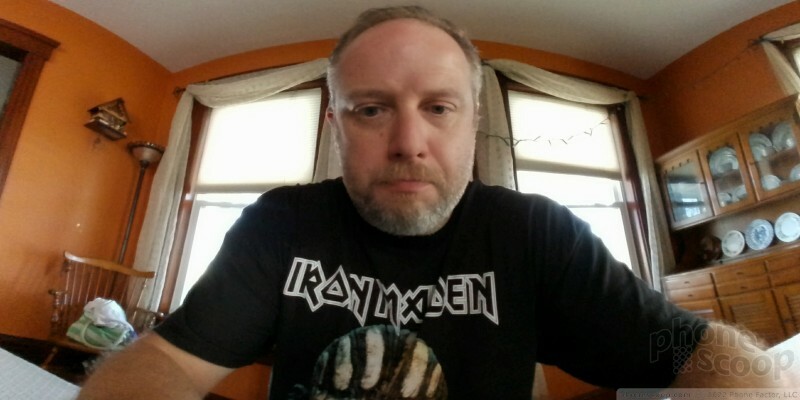 But I've seen dramatically better results from dedicated 360-degree cameras, such as the Samsung Gear 360. The Moto 360 Cam costs $299. 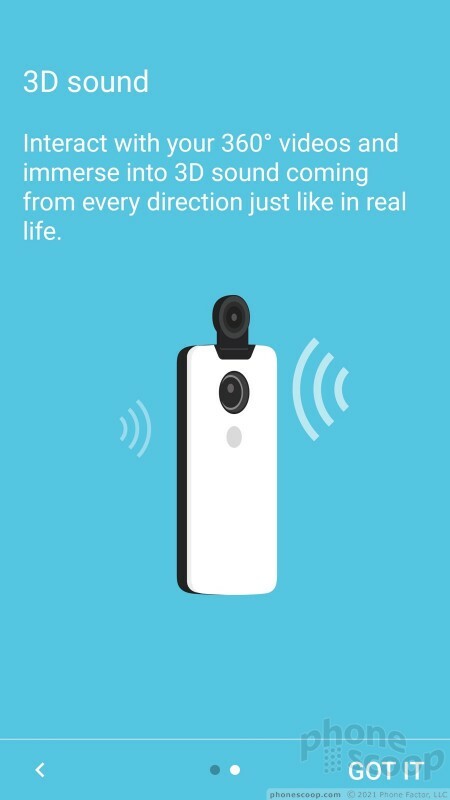 That's a huge expense, and $70 more than Samsung's 360-degree camera. Moreover, it's limited to just the Motorola Z-series handsets. There are much better stand-alone 360-degree cameras that are compatible with a wider array of devices and platforms for the same — or lower — price. I would only recommend the 360 Cam Mod if you can get it as part of a bundle or at a reduced cost.